The Prophet RAEL nominates Professor OBENGA and Dr. KABONGO "Honorary Guides for Humanity"
"Yes, Africans must cut all ties with the old colonizers and turn to China, Russia, India or other former colonized. Africans must also be informed at school that the so-called "European civilization" in fact owes its existence only to African civilizations, which were the basis of Egyptian and Greek civilization. "RAEL has been formulating these recommendations to Africans for three decades", says Bishop Guide Tai Ehouan. "In the world global political context, which is putting more and more pressure on the future of Africa, it is a pleasure for Raelians to see Pan-Africanists begin to realize this need for a radical break with the West. 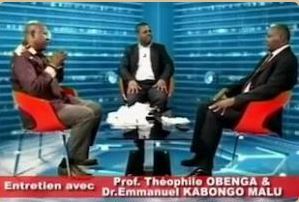 The stances of Professor Obenga and Dr. Kabongo are therefore a perfect leaven for the conscience of African youth ". PHOENIX, June 3 – According to a statement released today, the Back to Kama Organization is supporting a campaign for Juneteenth to become a national holiday throughout the nation. Juneteenth is the oldest known celebration commemorating the end of slavery in the United States. Juneteenth celebrations are also held in other countries around the world because of the African Diaspora: including Ghana, Honduras, Trinidad, Tobago, Japan, Taiwan, England, and France. The BTK (www.backtokama.org ) will celebrate the 151st anniversary of Juneteenth in the US in: Elizabeth City, N.C.; Houston, Texas; and Phoenix, Ariz. He explained that Kama is the original name for Africa used by its indigenous people and added, “Back to Kama is a voluntary migration campaign to encourage well-educated, successful and affluent people of all races and religions – particularly those who are descendants of slaves – to voluntarily transfer to Kama the knowledge and wealth they have rightfully accumulated in the Americas and relocate their businesses and operations to Kama." The organization believes governments on both sides of the Atlantic can gain much from a stronger Kama. It is therefore encouraging them to offer incentives for African-Americans and other descendants of slaves to establish businesses in Kama and to move their operations to specialized Free Trade Zones. “Lets embrace this opportunity to stand together for this 151st Juneteenth to celebrate freedom and the advancement of all human beings on planet Earth,” Green concluded. LAS VEGAS, March 6 – Several years ago, Rael, spiritual leader of the International Raelian Movement (IRM), inspired the movement “Back to Kama” (the original name for Africa used by its indigenous people) to encourage well-educated, successful and affluent people of all races and religions – especially descendants of slaves – to migrate to Kama and relocate their businesses and operations there, along with transferring knowledge and wealth accumulated in the West. Describing the obstacle as one that is “of an administrative nature and easy to overcome,” Rael went on to compare the current situation with the one that existed right when the nation of Israel was first created. He pointed out that the Israeli government immediately established ‘The Right to Return,” whereby any Jew, no matter where he or she lived at the time, could immediately receive an Israeli passport and the right to live in Israel. In today’s statement, Rael asked all Raelians in Kama to launch a broad campaign that will pressure that continent’s governments to immediately adopt right-of-return laws for all descendants of American and Caribbean slaves. LAS VEGAS, Feb. 7 - “For February, Black History Month, our organization will intensify its contacts with influential people who could benefit from a return to the African continent, known as Kama to the original inhabitants before colonizers came and renamed it,” said Dr. Gbedia Dodo, President of the Back to Kama Association, in a statement released today. Dodo said the Back to Kama (BTK) dream was launched in March 2009, after international spiritual leader Rael emphasized in a speech that the African continent should be saved first to avert violent global self-destruction and the end of humanity. “Kama has the potential to reach a modern post-industrialized level quickly, and without the need to go through the industrialized steps taken by the West,” Dodo explained. Dodo said the new campaign is primarily targeting the African-American community. She said her organization’s goal is to support new entrepreneurial efforts in Africa by informing the West – and successful African-Americans in particular – of the superior benefits to be derived from doing business in Kama. “With the increasing financial crisis in the United States and Europe, many nations in Kama are becoming the best destinations for successful business investments,” Dodo pointed out. She said the Back to Kama team will contact celebrities, entrepreneurs, scientists, engineers and business people throughout Black History Month. Rael congratulates the Senegalese President Abdoulaye Wade for his offer to repatriate the Haitians and he encourages other Presidents to do the same and to extend the offer to all slaves’ descendents.